Bollywood superstar Akshay Kumar has contributed a lot to the Hindi Film Industry. The actor is known to give four films a year and the year 2016 has been a fruitful year for him as all his three films – Airlift, Housefull 3 and Rustom have entered the 100-crore club in just a single year. His contribution does not stop here. Akshay Kumar is a generous man and has contributed in several charities and campaigns as well. Akki has again done something extraordinary which proves that he is a man with a big heart. Akshay Kumar has extended monetary help to Ravi Shrivastava who is suffering from the kidney failure. It is not known to many but Ravi was the one who gave Khiladi Kumar a breakthrough in Bollywood. When the actor was in his struggling days, Shrivastava was the producer to offer him a film titled Dwarpaal, though the film got shelved. Later, Shrivastva helped Akki to make his debut with the 1992 movie Saugandh. When the Rustom star came to know about the health of Ravi, he extended his support to help the producer. 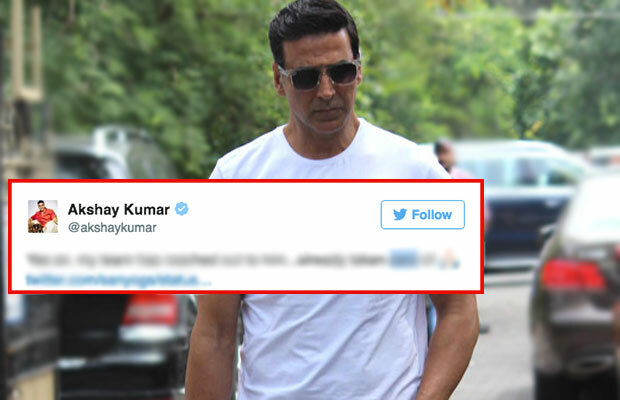 The actor himself confirmed the news on Twitter when one of the users asked for help from Kumar. The actor took to twitter and said, “Yes sir, my team has reached out to him…already taken care of”. The gesture made by the actor is really heart-warming and he surely deserves to be respected for the same. We can surely say that Akshay Kumar is a hero in the real life as well. On the work front, Akshay Kumar will be next seen in Jolly LLB 2 which is slated to release on 10 February, 2017. Next articlePahlaj Nihalani Issues A Statement On Ae Dil Hai Mushkil Ban!